7 General David Praporgescu Str. 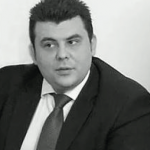 Adrian Roseti is a partner at Drakopoulos Law Firm Romania. He represents several domestic and multinational clients and his practice focuses on Customs and IP law, with an impressive track record in related Dispute Resolution. He is best known for his acute market sense and giving clients pragmatic, business oriented advice. Adrian is a contributor to various prestigious publications and is recognized by the most renowned international directories such as Legal 500.